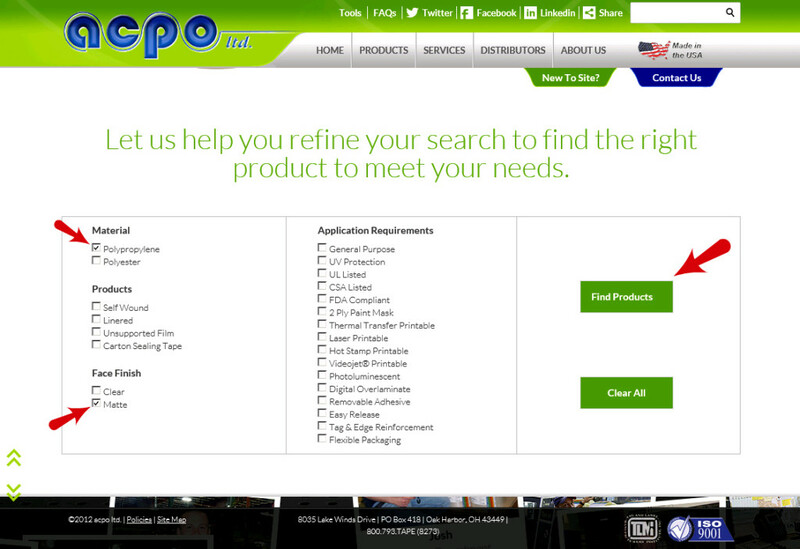 Try Our New Product Chooser Tool! 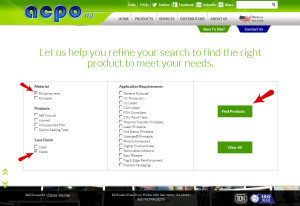 One of our favorite features on our new website is the Product Chooser tool which gives you the ability to select criteria to narrow your product search. There are two ways to get to this tool: either from the home page or by clicking Products on the menu bar. So how do you use the Product Chooser? 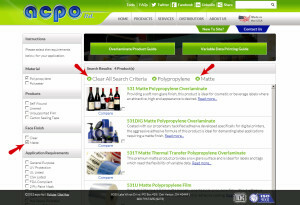 We’ve made it similar to other online shopping websites where you click checkboxes next to the criteria. You can check as many or as few options as you like. 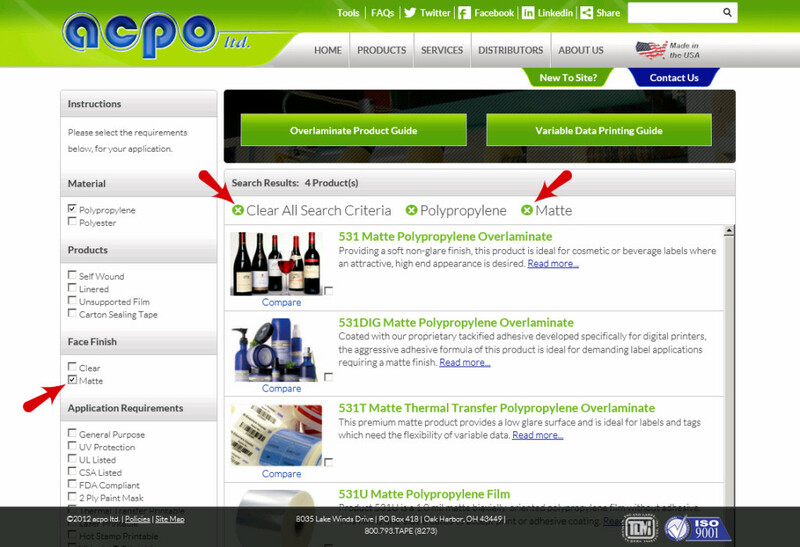 For example, if you are simply looking for all matte polypropylenes we carry, under Material select Polypropylene and under Face Finish select Matte. If you only know that your application requires a UL compliant product, select UL Listed under Application Requirements. Once you have made all of your selections, click the Find Products button to be taken to our Products Page with a listing of products meeting your specifications. From this screen you can further narrow your search by selecting additional requirements from the options on the left side. If you would like to start your search over or remove certain criteria, you have three options: 1) uncheck the box(es) in the left column, 2) click the X next to the criteria you’d like to remove or 3) click the Clear All button. Click on the thumbnail images below to englarge screenshots. Hint: If you navigate away from the Products page and decide to perform another search, our Smart Selector will remember the criteria you already chose. This will help ensure your specifications aren’t erased if you accidentally click on another page or link. Remember, at any time you can choose to Clear All to start over with the Product Chooser. This entry was posted in Help Topics and tagged help, products chooser, tools on June 26, 2013 by Cindy Dunfee.